Fawns found with their dead mother or those born as a result of a pregnant doe being hit by a vehicle, are the only fawns we label as true orphans. These need immediate rescue so that they do not develop problems. A fawn found in the area where a doe was hit may not necessarily be the fawn of that doe and should not be rescued unless it develops signs of distress. 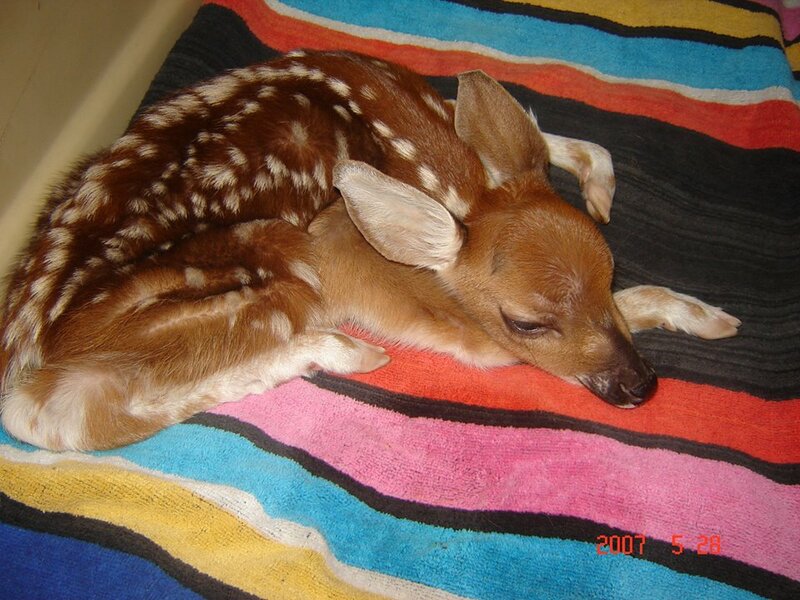 An orphaned fawn will quickly develop signs of distress indicating that it’s in trouble. Dehydration will be visible within a day or so and is indicated by curling of the ears, ruffling of the fur, and dulling of the eyes. Ear-curling is the first sign seen as the rounded edges of the ears will dry and begin to roll back at the tips. Injuries are often obvious. Punctures from animal attacks and fractured limbs will become infected quickly with maggots and bacteria. Prompt treatment by a wildlife rehabilitator or veterinarian is necessary. Diarrhea is another life-threatening condition for a fawn. Soiled fur will attract flies and cause maggots to form around the tail as well as the face, between the hooves, and in the developing scent glands on the legs. The maggots will enter the body cavities and begin eating the deer alive. Maggots and maggot eggs are an immediate sign of distress, and action needs to be taken quickly if the fawn is to have a chance of surviving. Fawns will often be seen lying curled up or on their abdomens, flattening themselves to the ground. A fawn lying flat out on its side with its legs extended is in severe distress. A hungry fawn will cry out for its mother. This is normal. Extreme and continuous vocalizations for an extended period of time can be a sign that the mother is not returning. Great care must be taken, however, with a crying fawn. The mother may not respond because you are in the area, making you believe that the fawn has been abandoned, and some fawns can be very vocal and demanding naturally. When dealing with a crying fawn, an examination should be done to determine if there are other signs of problems, such as dehydration.